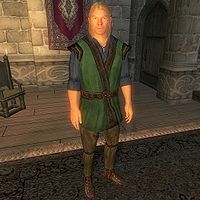 Nels the Naughty, a Nord barbarian, is a guest at Summitmist Manor in Skingrad. His daughter, Olga, was killed by bandits during a raid on his village in Skyrim and the local garrison of the Imperial Legion did nothing to stop it. For this reason, he dislikes soldiers like Neville and regards them as "useless, uncaring tools of corruption". He wears middle-class attire consisting of a blue & green outfit and a pair of quilted shoes. He also carries a bottle of mead and some gold. Esta página foi modificada pela última vez à(s) 18h54min de 9 de dezembro de 2014.